1) Simply slice boiled red potatoes and top with sour cream or creme fraiche. 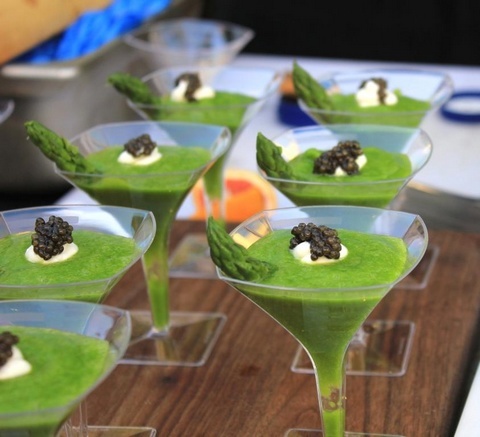 2) Apply a dab of premium salmon caviar or Classic Osetra Caviar on top. 3) Add thinly sliced green onion to taste. 1) Apply dab of fresh Classic Osetra Caviar. 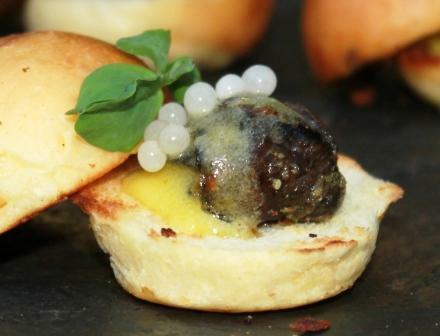 2) Top caviar on mini toast/crackers with cream cheese or butter. 3) Dine in style with this delicious appetizer. Place the mushroom upside down and fill with Fresh American Sevruga Caviar. Slice the cucumber to thin slices and organize around the plate. Arrange the three pieces of wheat bread (as shown in photo) and place the smoked fish fillet on top. Slice the tomatoes and place near the smoked fillet. Roll a thinly sliced portion of fresh smoked salmon. Top with Creme Fraiche. Top the creme fraiche with fresh trout caviar. Amazing quick appetizers for your guests. 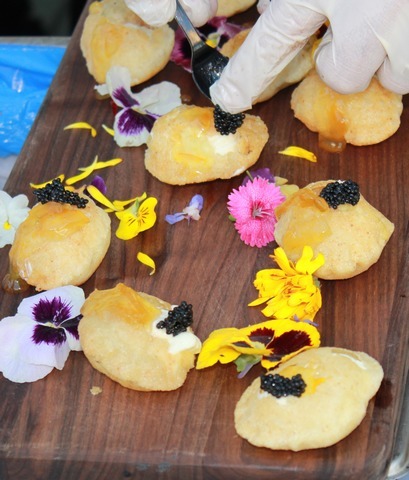 Place a generous dab of Russian Osetra Caviar on top of the blini. Then place a small dab of wassabi topping the Imperial Osetra Caviar. Cucumber salmon cups with caviar. For the cups: Partially skin your cucumber to make stripes. Cut your cucumber into 1 inch slices and with a melon baller scoop out some of the middle to make a cup. For the salmon cream: Take 1 pound of smoked salmon, 1 pound of cream cheese, 2 heaping table spoons dried dill, 1/8 tea spoon of salt, 1/8 teaspoon of sugar and enough heavy cream to smooth it out while keeping it thick. Using a pastry bag with a big tip squeeze mixture into the cucumber cups and garnish with a sprig of fresh dill and some salmon caviar. 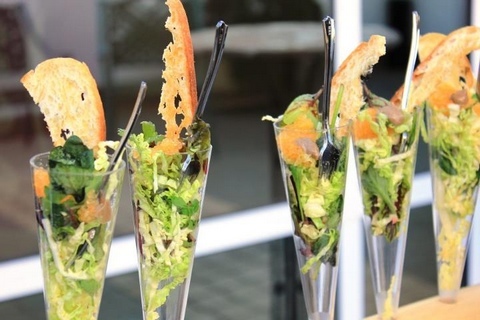 Quick and easy to serve appetizers for your guests. Flatten mango slices and place it on each plate. Steam rice. PLACE smoked salmon slice on a flat surface and lay the seaweed sheet on it. spray a bit of water and make sure that they stick. roll it with the steamed rice and slice the cylinder every 1in-1.5in. 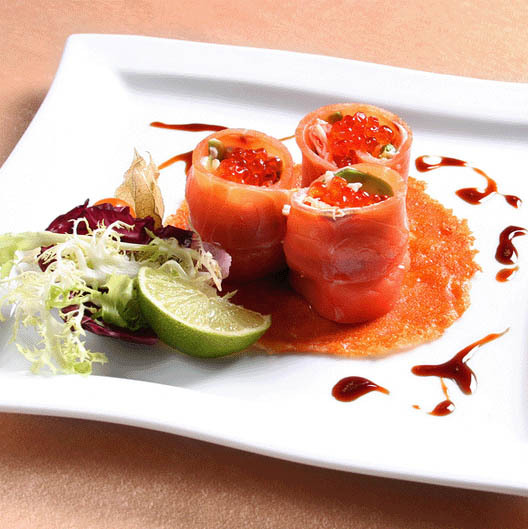 place the salmon caviar on top of each creation and place 3 units on each plate. place a slice of lime, parsley/chives/sprouts over a side slice of red onion. decorate with premium truffle vinegar. 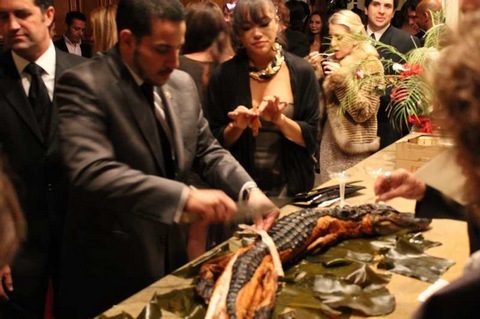 Learn caviar recipes from celebrity chef Marcel Vigneron at Beverly Hills Caviar Tasting Club Event in a private Bel Air Mansion. To watch the video simply click on the photo on the left.